Opposition continues to grow against plans to build thousands of new homes in the borough. Around 250 people packed into a public meeting to hear of plans to build 3,000 houses on green fields surrounding Murton, Monkseaton and Shiremoor as part of North Tyneside Council’s draft Local Plan. The Local Plan is currently out for public consultation before being submitted to the independent planning inspector. But Conservative councillors, who are concerned people may not take part in the consultation as they are distracted by Christmas, have hit out at the plans, saying it will result in a loss of open space and increase traffic problems in Monkseaton and near North Tyneside General Hospital. But Mayor Norma Redfearn said the Local Plan was vital and needed to be in place by 2017 to protect areas of land from excessive housing developments. She said: “As a council we are under increasing pressure from central government to have a Local Plan in place that identifies how land will be allocated to new housing, employment and retailing. “In fact the Prime Minister David Cameron has stated that local councils must produce local plans for new homes in their area by 2017 – or the government will ensure, in consultation with local people, those plans are produced for them. “It is hoped that this North Tyneside plan will not only protect the unique character and attractiveness of our borough, it will also make available the land that is required to provide the jobs and homes to meet our needs, and those of our children and grandchildren. “It is a very important document for the future of North Tyneside, and one we have been working on for several years. “We believe it is imperative that local people, businesses and communities were given every opportunity to make their views known before it goes onto the final phase of consideration with a public inquiry by an independent government appointed planning inspector. “We have assessed our economic growth on figures provided by central government and have made a modest assessment of the numbers of additional jobs. “This predication is the starting point of the local plan as it is determined by a government formula based on the number of houses needed to sustain that growth. 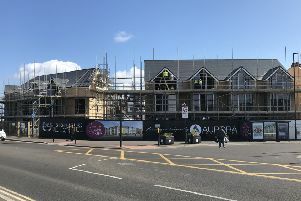 • Residents who live in New York, Shiremoor, Monkseaton and Murton – who have created the Murton Action Group – have called a public meeting to discuss the Local Plan. It will take place on Tuesday, December 8, at 7pm, at New York Social Club. Council representatives are believed to be attending.